Nancy Germond is hosting this week’s Cavalcade of Risk at her blog, Insurance Copywriter. She should get hazardous duty pay – she tells us that it is 113 degrees by noon on any given day in Phoenix – yikes. Nancy’s post covers topics as diverse as damaged guitars, dog health, and – of course – the health care debate. By the way, you can find more risk-related articles authored by Nancy at AllBusiness. As we noted previously, Roberto Ceniceros has been attending the Disability Management Employer Coalition annual meeting and has been posting about the meeting on his blog. We found one item that he wrote about in Business Insurance of particular interest: his report that Harley Davidson is using functional assessments to reduce workers comp and disability claims among new hires and in its return-to-work programs. Hanover, Md.-based BTE Technologies Inc. provides the electronic functional assessment testing system and accompanying software and evaluates worksites to perform physical-demand analyses. The “…system evaluates attributes such as range of motion, dexterity, grip strength, lifting ability and tolerance of certain positions. Employees are measured by pushing against a column, lifting weights and other efforts matched to specific job requirements that are recorded electronically.” The company estimates savings of nearly $260,000 in workers comp claims costs by preventing new hire injuries alone, which doesn’t encompass the other benefits and savings from the disability and RTW components. In Risk and Insurance, Peter Rousmaniere launches a three-part series on health issues facing veterans as they return to the workplace. His first post tells the story of one Sgt. Stephen Kinney of New Hampshire, ho was the victim of an IED explosion on the outskirts of Camp Anaconda in Iraq. Among injuries, Kinney sustained brain injuries and post-traumatic stress disorder (PTSD) that left him unable to resume his prior job as mail carrier. NIOSH Science Blog posts about safe and health green jobs and tells us that, with its partners, NIOSH has launched a Going Green: Safe and Healthy Jobs initiative. The note that as America moves towards energy efficiency and more environmentally-friendly practices, it is likely that there will be changes to traditional jobs and the creation of new kinds of occupations. The purpose of the initiative is to eliminate hazards in the green jobs through planning, organization, and engineering – a concept known at NIOSH as Prevention through Design (PtD). Supporting Safer Healthcare posts that U.S. News & Word report has issued its 2009 list of best hospitals. Back in May, we blogged the appalling story of Albania Deleon, a legal immigrant who founded Environmental Compliance Training (ECT), the largest asbestos removal training school in New England. Despite the fact that the training only requires 32 hours, she frequently sold certificates of completion to “students” who never attended classes. In other words, she sent these marginal workers – many of them undocumented – into asbestos-ridden jobsites with no preparation whatsoever. Well, Albania, meet Chong-mun Chae, an illegal immigrant who ran a Queens-based asbestos removal company apparently modeled on ECT standards. Chae claimed to have only one employee, a receptionist. In other words, his company removed asbestos from job sites all over New York, but he accomplished this without any workers. By calling his workforce “independent contractors,” he avoided workers comp premiums to the tune of $1.6 million. As we read in the New York Times, Chae has been sentenced to 4 years in prison, to be followed by deportation to South Korea. Chae avoided detection for over a decade by frequently changing the name of the company. He was not without a sense of humor – let’s call it diabolical – as one of his company’s incarnations was “Charlie Brown Services.” His premium avoidance scheme was exposed when an investigator read a report filed by Chae stating that he had no workers. You might think that a connection would easily be made between a company with hundreds of thousands in billings and no payroll, but that was not the case. In our collective haste to get rid of asbestos, we try not to think very much about the people actually performing the work. Chae, like Albania Deleon, is getting off lightly. After all, he has only been convicted of insurance fraud. At some point in the not-too-distant future, when Chae is enjoying his retirement in South Korea, he will be guilty of murder, as his phantom workforce and their families succomb to debilitating lung disease. We don’t know who they are or where they live. Collectively, perhaps we don’t really care. Entrepreneurs like Chae and Deleon exploit the margins of the working world, removing a deadly menace in a deadly manner. They offer jobs that pay relatively well, to a workforce that labors in the shadows. Chae and Deleon are nothing less than murderers. It’s too bad that our system of justice is incapable of holding them accountable for their deeds. If hell operated a dating service, surely the decrepid Chae and the fugitive Deleon would be a match: at 71, he is a lot older, where Deleon is a single mother with a now-abandoned 3 year old child. Despite the difference in ages, however, they have a lot in common. They have ruined hundreds of lives, wreaked havoc on thousands of families and reaped the profits of a corrupt business scheme. With values like those, age is surely no barrier. Summer brings extremes in weather that pose dangers to workers and challenges to employers who must plan for worker safety. This week, four construction workers were hit by lightning in Michigan. A quick Google search demonstrates this is not an anomaly – refinery workers, airport workers, firefighters, farmers and other working people all have too-close encounters with lightning, and a surprising number live to tell the tales of their harrowing lightning encounters. While experts put your odds of being struck by lightning in any given year at 1 in 700,000, your lifetime odds narrow to 1 in 5,000, and your odds of knowing or being affected by someone who is struck by lightning are 1 in 500. And while it is not totally understood why, some people are struck more than once, such as this unfortunate Oklahoma plant worker who has been hit by lightning 4 times. The National Weather Service (NWS) keeps track of annual lightning fatalities by state. This year, there have been 25 fatalities, with 4 of those occurring in Florida. Experts estimate that about a third of all injuries occur during work. Survivors often face daunting medical after effects, which can include personality changes, seizures, memory lapses,fatigue, and depression. Victims are also often are left with permanent scars and markings that are sometimes referred to as lightning flowers or lightning trees, or arborescent erythema. For help in learning about or coping with lightning strike after effects, survivors and their families can turn to the non-profit support group Lightning Strike & Electric Shock Survivors International, Inc. (LS&ESSI, Inc.). Paul Testa of New Health Dialogue Blog takes the notion of a carnival to heart while hosting this week’s edition of Health Wonk Review: All’s Fair in Love and Health Reform. Join him as he takes us along the Midway that is Pennsylvania Avenue, the big tent of bipartisanship, the funhouse mirrors of the health reform debates, and the roller coaster rides in Congress. Great edition! Think you can safely text while driving? Studies show that drivers overestimate their ability to multitask behind the wheel. This game from the new York Times measures how your reaction time is affected by external distractions: Texting While Driving Simulator. West Virginia touts progress one year into privatization. Cited among the successes: 154 insurance companies have active workers compensation policies in the voluntary market, the unfunded liability on “old fund” claims has dropped by more than half to $1,5 billion, and claim protests have fallen 68%. Attorney Jon Gelman looks at the challenges that declining salaries and unemployment pose to workers’ compensation. 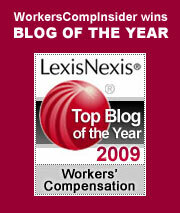 Roberto Ceniceros is blogging from the Disability Management Employer Coalition conference. His report yesterday focused on the generational impact on disability, with each generation facing different disability drivers. The following article is a guest post by Joey Lucia, a loss prevention supervisor at Austin-based Texas Mutual Insurance Co., the largest provider of workers’ compensation insurance in Texas. Non-English-speaking Hispanic workers present unique safety challenges. Picture this: It’s your first day on the job with a construction crew. Your boss asks you to help lay a foundation for an office building. High above, another worker is walking along a scaffold. He accidentally kicks a hammer off the scaffold, and you’re directly below it. Fortunately, your company embraces a “total safety” culture. In a “total safety” culture, employees look out for one other. Everyone is accountable for not only their own safety but also their co-workers’ safety. With that in mind, someone yells, “¡Cuidado, el martillo se puede cáer sobre ti!” Your co-worker warned you to get out of the way. If you didn’t understand Spanish, you might have been involved in a serious accident. In 2006, Hispanic workers died at a rate that was 25 percent higher than all other workers in the United States, according to a study published last year in Morbidity & Mortality Weekly Report. As of 2006, nearly 20 million workers in this country were Hispanic, making them one of the fastest-growing segments of the U.S. workforce. Here are some tips for keeping non-English-speaking Hispanic workers safe. Follow the ones that fit your business, and you can help make your workplace safer and more productive. Language can be a barrier to communication, even among people who speak the same language. Imagine how hard it is for Hispanic workers who speak little or no English. Use more pictures and fewer words to point out hazards and teach safety procedures. Most communication is nonverbal. Watch workers’ eyes, body language and expressions to see whether they understand instructions. Train supervisors in basic, conversational Spanish. Send non-English-speaking Hispanic workers to a conversational English class. Focus on commonly used words in your industry. Hire Spanish-speaking supervisors who have experience in your industry. Ask bilingual employees to translate safety messages. If you have training requirements, the Occupational Safety and Health Administration mandates that you provide them in a language that workers can understand. Hire a translation company to put safety training material into Spanish. Make sure the translator is fluent in the Spanish dialects spoken by your employees. Many Hispanic workers do not have the luxury of pursuing their education because they have to help support their families. About 40 percent of Hispanics age 25 and up do not have a high school diploma, according to the U.S. Census Bureau. By comparison, about 14 percent of the total U.S. population does not have a high school diploma. Provide simple, hands-on safety demonstrations. Do not let employees start work until they show that they understand the training. Provide follow-up training, and be sure to address new workplace hazards. Have you ever been afraid of asking a question in front of a large group of people? Imagine asking it in a different language. Non-English-speaking Hispanic workers may put themselves at risk because they’re too embarrassed to ask questions about safety procedures. Some may even fear for their jobs if they report unsafe working conditions. Encourage every employee to report unsafe conditions. Offer safety training away from the workplace. If the trainer is someone other than a manager, employees may be less intimidated and more likely to ask questions. Make sure non-English-speaking Hispanic workers have peers they feel comfortable talking to. Deliver the safety message to employees in their environment. For example, distribute Spanish-language safety training material at community functions. Reward safe behavior in front of co-workers. Take time to learn about your Hispanic workers and their culture. When it comes to safety, make sure you speak the same language! Mandatory English at the workplace? College athletics is big business. While athletes are not paid for their efforts (well, some are), they can reap substantial benefits while pursuing glory on the playing fields of their Alma Maters. But athletes, like workers, are prone to injuries. And once injured, they may find themselves liable for the cost of medical treatment. There is no workers comp for injured athletes, but perhaps there ought to be. Kristina Peterson writes in the New York Times that athletes are often stuck with the medical bills for sport injuries. Students may have coverage through their parents’s insurance policies, but these often exclude varsity sports, limit out-of-state treatment or do not cover much of the bill. Schools may offer supplemental plans, but these vary greatly. Athletes who play for major Division I schools often benefit from robust coverage. Big Ten athletes rarely have to pay for medical treatment. The NCAA offers catastrophic insurance for all athletes, but coverage begins at $90,000. An athlete would run through an awful lot of treatment to reach that level of medical billing. Even in the Big Ten, where insurance coverage is robust, stuff happens. Jason Whitehead played football at The Ohio State University. He was badly injured during a practice and was airlifted to a hospital. Whitehead lost his scholorship one year after the injury. He also ended up with $1,800 in medical bills not covered by his father’s insurance or by the school’s. The school valued Jason as an athlete; as an ordinary student, well, he ended up pretty much on his own. As in workers comp, medical coverage for student athletes is complicated by factors that may or may not be directly related to the injury. Erin Knauer went out for the crew team as a freshman walk-on at Colgate University. She had a cold when she took a five kilometer workout test on rowing machines. On pace for the fastest time, she suddenly felt a shooting pain beginning in her back and reaching her toes. She eventually was diagnosed with postviral myositis, a muscular inflammation that causes weakness and pain. Colgate officials determined that this was an illness, not an injury, so financial responsibility fell to Knauer. She tapped out her student health policy at $25,000, leaving her $55,000 in debt. She is currently working two jobs and paying down the bills at the rate of $250 a month. There is little doubt that Knauer’s illness was exacerbated, if not caused, by the strenuous workout. If this had been a work-related situation, comp would likely have picked up the entire tab (plus indemnity). But as a student athlete, Knauer has no guarantee of coverage. She wanted to row for the glory of Colgate. She ended up in serious pain and serious debt. Glorious it was not. The rationale for mandatory insurance for athletes is similar to the rationale for workers comp. The schools benefit from the labors of their athletes. The least they can do is pay for any and all medical treatment required to make these athletes whole. Roberto Ceniceros blogs about the New York appeals court ruling in Frank P. Torre v. Logic Technology, which awarded workers comp benefits to an employee for an injury sustained in the gym. Usually, injuries sustained in extracurricular activities aren’t covered by workers comp, but there are exceptions, such as when injuries occur during “mandatory attendance” events or while an employee is on business travel (see our past posts: Mandatory fun: when recreational activities are compensable and When play becomes work, or the case of the traveling employee). On first glance, a case like this might seem open and shut. The employee was on his own time at the gym – the injury did not appear to arise out of and in the course of employment. But on closer examination, the court apparently determined that gym participation was furthering the employer’s interest for the networking potential. (Is gym the new golf?) When it is determined that an employer has derived significant business benefit from an activity – such as interacting with clients and prospects – then an activity may be compensable. The courts also noted that the employer encouraged and sponsored this activity. In this case, the sponsorship entailed reimbursement for membership fees. One has to wonder what kind of chilling effect a ruling like this could have on wellness programs. Employers frequently incent employees by paying for or supplementing gym membership, exercise programs, and weight loss or smoking cessation programs. Some companies offer financial incentives for participating in wellness programs or disincentives such as increased cost for insurance for not participating. This type of endorsement and sponsorship can be tricky when it comes to workers comp. In days gone by, sponsorship generally referred to softball or bowling teams and employers could take some steps top mitigate risks. But as employers become more aggressive about wellness programs in an effort to control health care costs and these wellness programs become more ingrained in the corporate culture, does the compensability exposure increase? Some of the variables that have come into play in determining compensability are the location and time of the activity – is the gym on the employer’s premises? Does the activity take place during work hours? Another factor is how strongly the company encourages participation and whether participation is purely voluntary. If a corporate culture is such that it so strongly endorses an activity, the issue of whether participation is truly voluntary could be up for debate. Comorbidities like obesity and diabetes have been shown to have an impact on claim frequency and severity so it would appear that wellness programs would have a positive net effect on workers comp costs. But good intentions can often have bad outcomes. Take the concept of programs that heighten worker awareness about safety and incent workers for best practices – that may sound great on the surface, but The New York Times recently reported on safety incentive programs that ran headlong into the law of unintended consequences. Our friends Jay and Louise Norris have posted The 82nd Cavalcade of Risk at Colorado Health Insurance Insider. Louise opens with our recent post on Atul Gawande’s health care article and she notes that if her own observations are to be believed, she’s seen signs of over-utilization in workers comp medical care, too. As might be expected with health care reform being such a hot button issue, much of this Cavalcade is given to the topic, but there are also several good items on the broader topic of risk – we particularly liked Nancy Germond’s article on enterprise risk management. Check it out – get your weekly fill of risk-related reading all in one place. Farm injury survivor Kristi Ruth learned the reality of that statistic the hard way. She was working on her family farm with her Dad and her brother in 2007 when her arm became entangled in a posthole digger’s PTO. “But as Kristi began to remove her hold on the three-point support bar by the auger head, the back of the glove on her cupped left hand caught on a shear bolt that was a quarter inch too long. Although the PTO had already begun to wind down, it was too late. In a frantic instant, Kristi’s left arm wrapped around the machinery up to her shoulder, breaking her bones with every rapid turn. She was trapped, and what started as a beautiful winter day suddenly became a horrific moment frozen by the piercing screams of her father and brothers and sounds of snapping bones and ripping flesh, like fabric being torn into rags. A race to free Kristi from the implement began. Her life hung by the threads of her torn coat. With the PTO stopped, Joe frantically jumped from the tractor and fished for his cell phone, handing it to Jake, who quickly dialed 9-1-1. With her good hand, Kristi reached for her own cell phone and gave it to Josh so he could also call for help while her father and Jake worked feverishly to untangle her. Kristi broke her arm in six places and severed a major artery. The level-headed response of her family and an incredible medical effort managed to save her life and her arm, although she has severely diminished functionality in that arm. But after several years of recovery and surgeries, Kristi is on the lecture circuit bringing the farm safety message to other kids. She’s also tells her story in My Name is Kristi, a safety DVD available from Iowa State University Extension Service. Even before her injury, Kristi was all too familiar with agricultural dangers – her uncle was killed in a tractor rollover in 2005. Farming is a dangerous business and encounters with PTOs continue to be an all-too-common common source of farming fatalities. PTOs must be shielded and guarded at all times. If you find the task of following breaking news developments on the health care reform front a trifle daunting, we have a solution: let the health policy blogosphere’s best braniacs dish up and dissect the news for you in bite size portions in the bi-weekly compendium of the best of heath care policy posts. Check out the fresh edition of Health Wonk Review: Crunch Time For Health Reform hosted by Ken Terry at BNET Healthcare Blog. MHSA – The Pump Handle tells us that Joe Main has been nominated for Assistant Secretary of Labor for Mine Safety and Health and posts some info on his background. Taking the industry economic pulse – With another quarter in the year under our belt, several industry watchers have taken the pulse of the industry’s health. In Business Insurance, Roberto Ceniceros reports that a tough climate is shaping up for workers comp. Among the many problems he notes, he reports that sources have told him that “…rising bankruptcies have insurers concerned that defunct businesses may not pay all their premiums and leave their insurer stuck with claims that should have been paid by the company.” Risk and Insurance features an article on a report from Fitch Ratings which discusses the challenges that the workers compensation market is facing in 2009. According to the report, underwriting performance is expected to worsen in 2009 as rate reductions persist. And we’ve recently noted grim news in the industry at large: first quarter of 2009 was the worst on record for property casualty insurers since quarterly results were first compiled in 1986. Training – Eric at The Safety Blog reports that OSHA is targeting fraudulent trainers in construction and general industries and is working to strengthen their trainer authorization program. They will be conducting more surprise visits to independent training centers to check for compliance with program requirements. Trainers are authorized to teach and to do outreach training only after completion of a one-week course in an OSHA Training Institute Education Center. Learn more about training certifcation: OSHA Outreach Training Program. H1N1 – Lloyd’s warns that pandemics continue to pose a threat to companies – Many feel the flu publicity and warnings earlier in the year were overstated because up until now, the manifestations of the flu have been very mild. According to WHO, there have been 429 fatalities out of 95,412 cases. Yet Lloyd’s points out that it has been having a devastating economic impact on some businesses and notes that, “Up to now flu cases have been relatively mild; however, Lloyd’s warned that “health officials worry that swine flu could mutate during the southern hemisphere winter and return in a more virulent form in the northern hemisphere this winter.” Keep up to date on any developments at Flu.gov. And in another waste treatment plant, a worker recently died of burns suffered in an explosion that occurred while he was cleaning a tanker at CES Environmental Services in Houston. The death was the third at a regional CES operation since December, unleashing criticism from area residents, activists and city officials, who are looking to shut down the plant.